Is the core liquid or solid? "The only thing we know for sure about the interior of Mars is that it has a core with a radius of between 1500 and 2100 km," says Christophe Sotin, a planetary geophysicist at the University of Nantes, France. Such certainty has come from measurements of the planet's moment of inertia taken by the NASA spacecraft, Mars Pathfinder. The moment of inertia is a measure of the way in which the planet rotates on its axis, which is influenced by the distribution of material within it. "The measurements reveal that there is something dense in the centre and less dense in the outer layers," says Sotin. The Martian interior is one of the big unknowns to be addressed by future missions to Mars. Understanding its structure is important because it will contribute towards an understanding of the formation of the atmosphere, the fate of life on Mars and ultimately planetary evolution, including the evolution of Earth. "The evolution of the interior of the planet affects the evolution of the surface and so drives the loss of ecological niches for life on the surface," explains David Stevenson, professor of planetary science at the California Institute of Technology. "Everything about the interior of Mars is uncertain because we lack seismological information. That is the most important goal for a future mission." The French space agency, CNES, is planning to build four small probes, called Netlanders, to address that goal. They will hitch a ride to Mars on board a French-built orbiter and will land at widely spaced sites. "On each Netlander will be a seismometer to detect Mars quakes," says Sotin. "The quakes are caused when the planet shrinks as it cools. We expect about 1000 quakes a year of magnitude three on the Richter scale and two of magnitude five. The four seismometers will be able to deduce where the quake occurred. As the seismic waves are going to travel through the planet, we can also determine changes in the composition of the material they are travelling through." As well as measuring the radius of the core to within 5 km, seismic data will also reveal what the core is made from and whether it is liquid or solid. 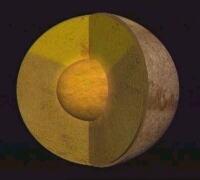 The moment of inertia measurements suggest it is made predominantly from iron, like the Earth's core. But it may also include some sulphur, which will lower its density and melting point. Earth's liquid core is responsible for our planet's magnetic field: the circulating molten metal acts as a dynamo. Mars has no magnetic field nowadays, though it did once in the past. However, this doesn't necessarily mean that its core is solid. "From a theoretical standpoint, the core can't be entirely solid, but it could have a solid inner core, like the Earth's," says Stevenson. Other clues to the Martian interior can be found by looking at the planet's surface. "We know the crust is an average of 50 km thick - we don't see craters that have punched down below the crust to the mantle. This is thicker than the Earth's crust, which isn't surprising" says Stevenson. As Mars is smaller than Earth but of a similar age, its outer layers have cooled and solidified to a greater depth than Earth's. However, the crust is far from uniform in thickness, with the crust in the south of the planet being thicker and older than that in the north. The great volcanoes indicate that underneath the crust is a mantle which is at least partially molten and from which hot plumes rise to the surface. "The volcanoes suggest convection in the mantle, but we don't know their precise source," says Sotin. The crust also bears scars of previous tectonic activity, such as the Tharsis bulge, where forces underneath the planet's crust have shaped it. But there's no evidence for plate tectonics, the process on Earth by which new crust is formed at seafloor spreading regions and old crust is swallowed back into the mantle at subduction zones. The lack of recycling is thought to explain why the Martian volcanoes have grown so large: movements in the planet's crust have simply never disturbed them. The tenuous evidence we have so far for the composition of the mantle has come, paradoxically, from a handful of rocks found on Earth. Tiny pockets of gas trapped inside the rocks have the same composition as the Martian atmosphere, suggesting that they originated on the red planet. They eventually found their way to Earth millions of years after being blasted off the Martian surface by major impacts. The rocks, known as SNC meteorites, are volcanic in origin and are thought to have welled up from the Martian mantle in the form of magma that then crystallised near the surface. Deducing the composition of the mantle from that of the meteorites, however, is no straightforward matter. The latest attempts suggest that the mantle has a similar composition to that of the Earth, but with a higher iron content. "From measurements on seismic waves, we will be able to put some constraints on the chemical composition of the core and mantle," says Sotin. The main contribution Mars Express will make to this area is in a better understanding of the composition of the crust (PFS, OMEGA, MARSIS).